A special three course 'Treats from Northumberland' menu for just £17.95 per person. Soup of the week -Pea and fresh mint soup. Swallows of Seahouses Kipper pate. Pigeon,bacon and red wine dressing salad. The Junction Burger with cheese,fresh salad and home made chips. Northumbrian Crane Row Pork, the loin cooked chargrilled and served on creamy mash with a mustard cream and fresh veg. Wallington Hall Lamb rump with coriander and cumin crust, rosti potato and rich redcurrant jus. Poached cod with peas, fresh mussels, tomatoes and cream served with new potatoes. Homemade apple and cinnamon crumble. De-constructed coffee and white chocolate cheesecake. The Junction Restaurant, a brand new stylish restaurant set in the heart of Widdrington Station in the ever beautiful county of Northumberland. Owned by local residents, Andy and Debbie Clarke, the restaurant opened in November 2011, offering a relaxed and welcoming atmosphere, wooden floors and soft lighting. 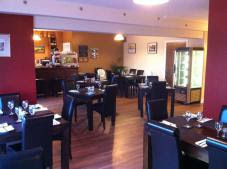 The Junction Restaurant offers an abundance of choice with a wide range of high quality food and drink selections. Our widely praised A la Carte Menu offers the best in local produce that Northumberland has to offer from locally sourced Beer Battered Black Pudding to tender Loin of Pork. We are certain you'll enjoy The Junction dining experience. Why not make a reservation today, we look forward to seeing you.